Glass of Fancy » 2015 » July - Fashion, fiction, and life in the city. Welcome to the July edition of Let’s Lunch! This month, we’re all sharing a recipe from our travels. I admit, I travel on my stomach. If I am going anywhere, what I want to eat while I’m there goes into the planning at about the same time as the plane ticket. (Looking to have some steak tartare later this month, and I REALLY need to get on that plane ticket thing.) This is particularly true on my trips to Texas, because I love Tex-Mex. Sure, it may not be authentically Mexican, but it is by far my favorite US regional cuisine. 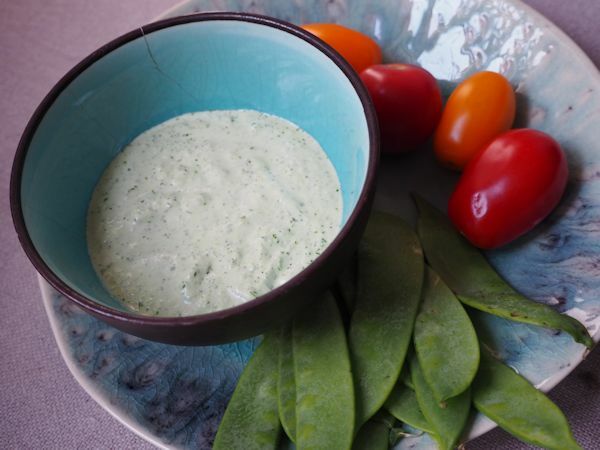 This recipe was inspired by the creamy jalapeno dip that one of my favorite lunch joints brings you along with the salsa and chips. This isn’t it (the exact contents of their recipe remains a mystery), but it still goes great with chips, crudites, or fish tacos, and should tide me over until my next trip south. Combine all ingredients in a food processor and blend until smooth. Adjust salt to taste and serve with tortilla chips or crudites. Hawaiian Island Panzanella Bread Salad at Spicebox Travels. Watermelon Cucumber Cooler Cocktail at Asian in America. Sardinian Seadas from Cheryl Lu-Lien Tan. Moroccan B’Stilla at Monday Morning Cooking Club. Rogan Josh at Tea and Scones.